In this category of Foraged Foods you’ll find everything related to acorns and wild nuts. This will typically include walnuts (if you’re lucky enough to find a wild walnut tree near you! ), chestnuts, cobnuts, beech nuts and pine nuts. Some of our nutty foraged recipes include the likes of chestnut soup, acorn coffee and cobnut nutloaf. Heres another really simple recipe for you to bear in mind for Autumn time when acorns are out in their numbers. Although a recipe for acorn coffee this drink doesn’t really resemble a taste anything like coffee, but it is still a very warming and nutritious, comforting drink to have on a cold winters evening. 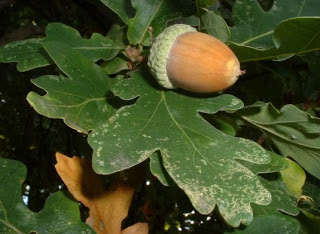 If eaten raw acorns have a really bitter taste and will leave a funny astringent feeling in the mouth, some people presumed that they were poisonous to eat but they just don’t taste that good – and so its best to process them before making use of them. Acorns are a plentiful food usually, especially after a wet year, and there is rarely an acorn shortage in the UK. 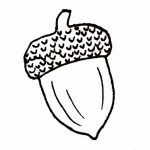 For this acorn coffee recipe you won’t need a set amount of acorns, but a couple of handfuls should provide you with several servings of this drink. Boil the acorns, shell included, for about 20 minutes. After this time you should let the acorns cool before trying to peel them from their hard outer shell. By boiling them you make peeling them easier and reduce their bitterness slightly. After removing the shell, peel off their outer skin. Next you need to split the acorns, which you can do with a knife or pestle and morter type implement. Put the split acorns in a warm area to dry for about 24 hours. An airing cupboard or warm kitchen worktop is an ideal place to remove moisture from the acorns. Finally you need to grind the split acorns up, if you can use a coffee grinder then use one, if not then just try to grind them as finely as possible. Place the grounded acorns onto a baking sheet and either place under a grill or in an oven to roast them until dark brown. You need to pay close attention to stop them from burning. Place around 3 tablespoons of the ground acorns in a cup of boiling water, like you would usually do with coffee beans. Add some milk and a small amount of sugar, and the acorn coffee is ready to drink.